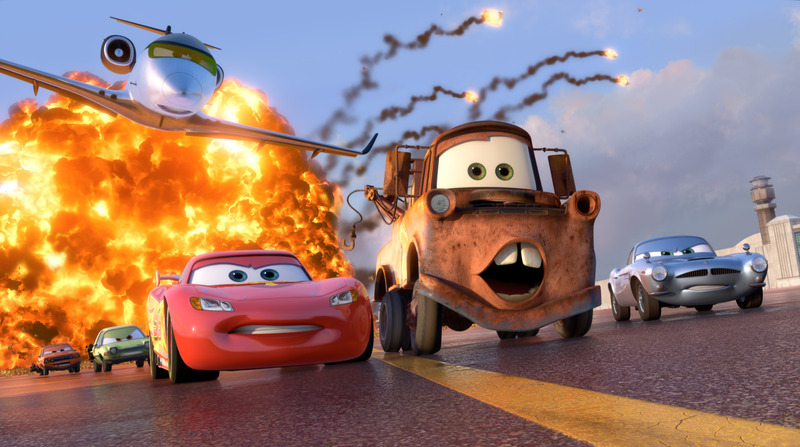 Pixar has an almost exemplary record, so when the original “Cars” appeared, it somewhat blemished the almost perfect critical record the company had enjoyed to that point. Pixar would not have been fazed, $5 Billion sales of toys related to the film dwarfed any Box Office return and even those were healthy enough. “Cars 2” aims to correct the previous mistake of a thin plot and a dubious central premise. The computer animated film starts well enough, with a well paced and exciting Bond pastiche, following a British Aston Martin secret agent Finn McMissile (Michael Caine) infiltrating and escaping from a villains lair, aboard multiple offshore oil platforms. We then return to Radiator Springs, home of Lightning McQueen (Owen Wilson) and his BCF (Best Car Friend) Mater, the rusty pick up truck (Larry The Cable Guy). McQueen has become a successful racer, winning the piston cup, now renamed the Hudson trophy (in honour of the late Paul Newman’s character in the previous film) but is taking some downtime in his home time with his Porsche girlfriend Sally (Hunt). Mater is acting in a manner that would get him slapped with a restraining order in real life but in cartoon land, just wants to spend more time with his best pal. Responding to a TV phone in boast, Mater enters McQueen in the “World Grand Prix”, a race organized by Sir Alexelrod (Izzard) to promote his new alternative fuel “Allinol”. This provides an excellent excuse to travel the globe, Italy, Japan and England for races between McQueen and his arch rival, the Italian Formula1 car, Bernoulli (Tuturro). F1 is never mentioned, perhaps due to contractual reasons, Bernie Ecclestone presumably not buying into the whole talking cars approach. The whole local support team are brought back onto the pit crew to assist McQueen on his quest and somewhat reluctantly, Mater is allowed along for the ride. Mater quickly messes everything up and inadvertently gets mixed up in International espionage with Finn and Holly Shiftwell (Mortimer), as they attempt to uncover a dastardly plot headed by Professor Zendepp (Kretschsmann). The professor, rather bizarrely, is in charge of an army or fleet of “Lemons”, cars that were inherently a bit rubbish. Cue the first torture scene in a Pixar film, admittedly off screen, as information is extracted from the unfortunate Rod Torque Redline. Various adventures and action sequences follow, crude stereotypes are employed, the Queen in England, Mafia types in Italy, does the main villain really have to be a German with a monocle, really, on a car? The film ends with a lengthy explanation of who did what and why, emulating the end of a “Scooby Doo” episode. This has never been necessary in a Pixar film before, normally what/why is covered subtly within the film, lengthy exposition has never been necessary, see the start of “Up” for how much can be conveyed in a short time. As ever, the animation and sound are faultless, the race scenes are more exciting than a F1 race, sound and picture in perfect harmony and the set pieces are fun, exciting and imaginative. With bright colours and talking cars, younger children will enjoy the film, just as they did the original “Cars”. Adults however, may be very disappointed. Not a word usually used in the same sentence as “Pixar”. The idea that cars can talk with their mouths animated and wheels acting as hands, in many ways just does not work. Arguably, too many liberties have to be taken to provide the cars with human characteristics and then you wonder, what’s the point? There are many segments in the film where the story is just, well, boring and yet this is normally a Pixar strong point. Eddie Izzard is a flamboyant comedian and yet here, is allowed to just read his lines with hardly any inflection, something he would likely have resisted given the opportunity. Wilson is bland, Mortimer a bit more lively but the voice cast is only really saved by a sterling performance by Caine, audiences will recognize his voice anywhere. Directed by the vastly experienced John Lasseter the head honcho at Pixar, this appears to be more an exercise in getting as many characters on screen, in as many different territories as possible to sell as many toys as possible. Whilst this may have been the net result of other Pixar films, you never felt it was their sole intention. Here it does feel like an extended Toy commercial in parts, sell the toys and wrap a film around that premise, rather than a great film that happened to spawn a line of toys. Fun for young kids but audiences who have left Primary school behind, may find little to interest them here, despite the excellent animation and action. Better than the original but inherits many of it’s flaws and represents a further minor disappointment from a studio that has always promised and delivered so much more.